Learning to see…… At Chelsea Fine Arts we believe that there is an artist inside every human being. From as young as 8 years to 18 years, we want to give you the chance to discover the artist inside of you. 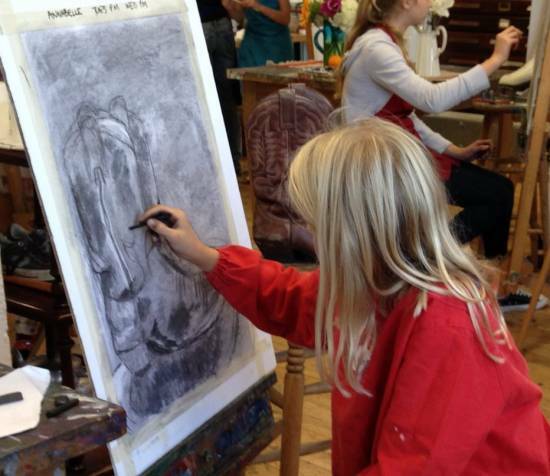 Chelsea Fine Arts offers you inspiring creative spaces to draw and paint with a full reference library, your own easel and many still life set ups for you to draw and paint. You can use the studio to create and discover and by following our methods you will learn about art and artists and improve your skills. Studio sessions can be booked in the term time and in the holiday sessions by clicking Term Courses or - Holiday Classes above. You will have the opportunity to use all sorts of different materials (charcoal, pencil, pastels, acrylic and oil paint, water colour, ink and mixed media).We will show you how to experiment with different media and teach you different techniques for capturing what you see. In no time you will be deciding for yourself what you need to do to translate what you have observed into your original work of art. When you are confident and want more of a challenge you can advance to the Intermediate level and learn more skills. 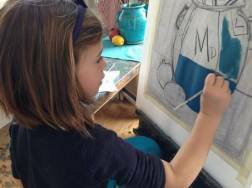 Scholarships.....If you are interested in your child being prepared for an art scholarship for secondary school, Chelsea Fine Arts is an ideal place becasue the focus is on observational drawing. Many of our students have gained scholarships to the leading public and independent schools. GCSE and A Level.....Many GCSE and A level students find that it is neither easy nor practical getting their art homework done at home. Not everybody has enough space at home and the mess that is often necessarily created is not always appreciated by the rest of the family……. 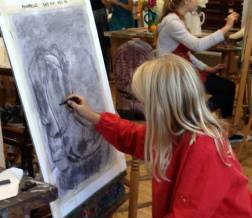 At Chelsea Fine Arts, you will find space and support to complete your assignments. The studios are light and spacious and you will have the opportunity to do your work in a relaxed atmosphere. You will have access to art supplies, materials and reference books. We will discuss ideas with you, develop your skills so that you can develop to your full potential. Our working artists have recently left art school and are dedicated to supporting GCSE and Advanced Level art students.